Jozra was born in Mexico City and like many of his peers, from a young age, wanted to be an accountant. For reasons known only to him he decided that it would be better to be a footballer when he grew up. Unfortunately he didn’t do either. That is neither grew up, nor become a football player. This is a shame because Jozra Garrido is a footballer’s name. Anyway, Jozra somehow managed to become a pretty decent scientist and armed with a degree in physics from Mexico’s top University (Universidad Nacional Autónoma de México), and a scholarship from the lovely people at CONACYT, he decided to work with me. His undergraduate dissertation was on semiconducting polymers and bought my book to help him with this, so he approached me to do a PhD. I was more than happy about this, but he wanted to arrive just after I had left to go to Milan on sabbatical. Anyway, to cut a boring story short, I thought he could do a spectroscopy PhD since that is the expertise of my friend and colleague (and an alumna of The University of Sheffield) Tersilla Virgili at the Politecnico di Milano. We also have an alumna of the Politecnico di Milano on our staff, so "Fast" Jenny Clark could provide local spectroscopy expertise. This was all a bit new to me, but that’s the fun in science. Anyway, he’s doing pump-probe and other optical spectroscopy experiments of the small molecule 2,7-Dioctylbenzothieno[3,2-b]benzothiophene, which has amazing charge transport properties, but has been less studied optically. Before Jozra came to Sheffield, I met him in Mexico and he took me to Teotihuacán. 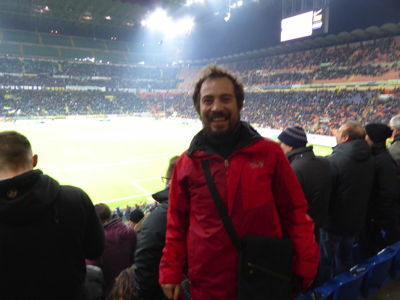 I have a number of impressive photos of him from there that I could use, but it’s perhaps better to use this pic of him at the San Siro, where we went to see Internazionale under the great Roberto Mancini play the less than mighty Frosinone.